Check this out. 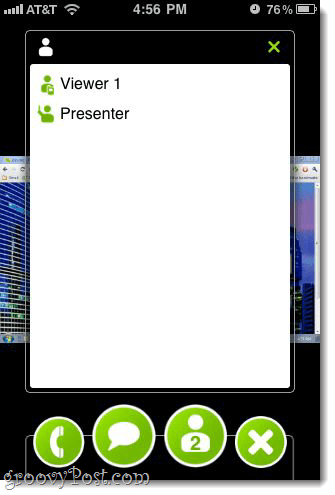 Our favorite groovy web-conference/remote assistance/screen sharing web-based service—join.me—now has a mobile viewer (now that was a mouth full). This month, join.me rolled out the iOS mobile viewer. The join.me iOS app lets you view shared Windows or OS X screens from your iPad, iPhone or iPod Touch (iOS 3.2 and up). 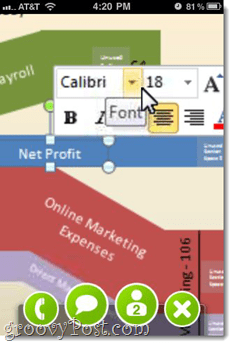 The app is almost as simple as the web version, which requires nothing but a web browser and Flash. 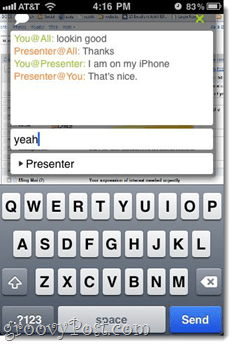 Now however, you can catch a conference call, webinar or team meeting using join.me from wherever you are as long as you have an iPhone, iPad or iPod-Touch. 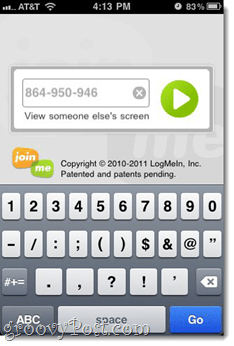 After downloading the join.me mobile viewer from the App Store and launching it, you are taken directly to a screen that asks for the join.me number for the shared screen. Remember: with join.me, you don’t have to register an account or sign up. Just punch in the join.me number from the host and away you go. This screenshot is a completely zoomed out view in landscape mode. In terms of smoothness, it’s as choppy as you’d expect from a web conference, but completely tolerable. Of course, your mileage will vary—I was testing this out on a WiFi connection. 3G speeds may be better or worse. You can pinch or double-tap to zoom in and then pan around with your finger, just like when you’re browsing the web. As you can see, it’s pretty sharp. Also, you can see the control buttons along the bottom in this shot. These are hidden automatically when you leave the screen alone. 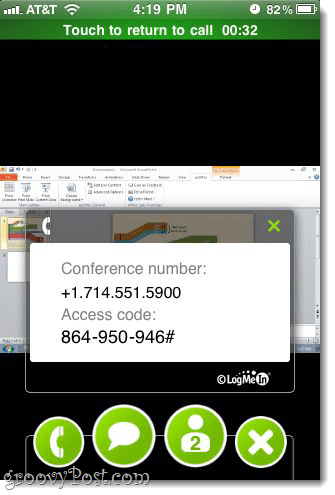 As you’ll notice, you have the Phone button, that displays the conference call number, the Chat button, the Participants button and an X to leave the join.me conference. What’s missing? File transfer and request control, which are understandably tougher to implement on a mobile platform. 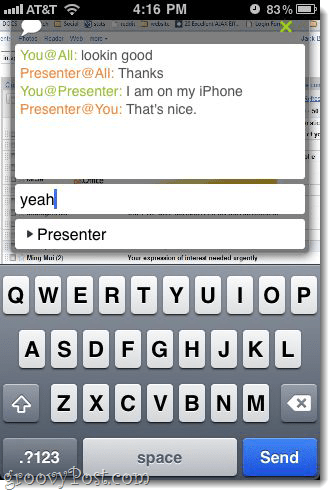 Not much of a downer, though, since I can’t imagine anyone feasibly running a web conference from their iPhone. The chat window works just like the desktop version. You can send chats to everyone or just one person at a time (PM). The only down side is that you can’t see the screen when you’re chatting, but I’m guessing that you can with the iPad version. The participant screen is exactly what you’d expect. No other functionality here. The conference call bridge actually is a bit lacking. 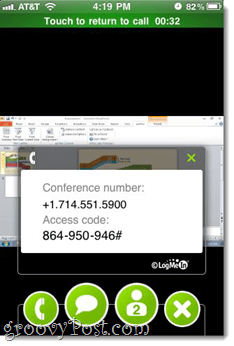 join.me doesn’t have VoIP built-in, which is fine, but the fact that you can’t copy and paste the conference number or the access code is kind of a drag. You can’t even touch the number to dial it automatically, like you can in almost every other app on the iOS platform. So, what are you supposed to do? If you can memorize both the 10 digit phone number and the nine digit access code, more power to you. Otherwise, you’re going to have to write it down on a piece of paper, switch over to your phone app, and then switch back. Drag-o-rama. But good news for AT&T customers (for once)—you’ll be able to stay on the call and view your join.me conference simultaneously over 3G. Verizon iPhone users will only be able to do both of these from their iPhone when they are on WiFi. join.me backgrounds nicely when you’re multitasking—I popped over to my phone app to dial in and came back and didn’t lose my connection. Overall, I like the join.me mobile viewer—I’m very glad it exists. 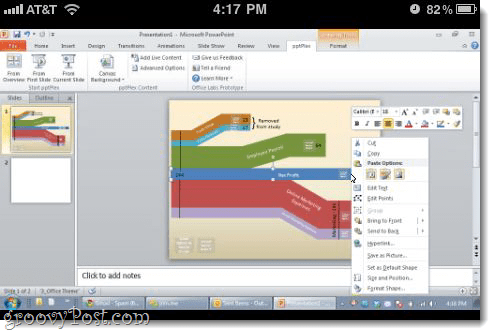 The lack of VoIP, file transfer and remote control are totally understandable. The awkwardness of the conference call is less forgivable. But maybe it’ll be there in the next update. Oh, and for Android users, you’re next. 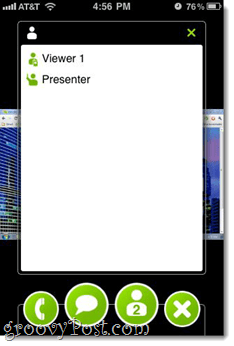 The Android mobile viewer is functional and coming soon to an Android device near you. Memory chips are manufactured with widely differing amounts of memory. The largest capacity memory chips can hold around 10 megabytes of information per chip, while in the future they will likely be able to hold hundreds to thousands of megabytes. Mozy.com Dumps Unlimited Plan–Time to Find an Alternative Backup Service!